BEIJING, July 28, 2011 – Alibaba Cloud Computing ("AliCloud"), developer of advanced data-centric cloud computing services and a subsidiary of Alibaba Group, has unveiled its internally developed cloud-based mobile device operating system, "Aliyun OS." The K-Touch Cloud-Smart Phone W700, the first mobile phone powered by the cloud OS, was also unveiled here today and will be introduced to the Chinese market at the end of July. AliCloud also plans to integrate the OS with other devices including mobile phones with larger screens and tablet computers in the coming months. The cloud OS will feature cloud services including e-mail, Internet search, weather updates and mapping&GPS navigation tools. A distinguishing feature of the cloud OS is its support for web-based apps. These offer users an Internet-like experience and do not require the user to download or install application software on their mobile devices. Cloud OS users can seamlessly synchronize, store and back-up data such as contact information, call logs, text messages, notes and photos to AliCloud's remote data center, and can also access and update this data across all their PC and mobile devices. AliCloud will provide each cloud OS user with a total of 100 gigabytes of data storage initially, with plans to expand according to user needs. Third-party developers can opt to either develop cloud apps over their own servers or choose to use AliCloud’s infrastructure and open platform services at a low cost and quickly develop their businesses. The cloud OS is the result of three years of development and uses AliCloud's self-developed distributed file system and virtual machine; the cloud OS is also fully compatible with Android-based applications. According to latest statistics from the Ministry of Industry and Information Technology, the number of 3G mobile users in China now exceeds 80 million, or 9.5 percent of all mobile users nationwide. Sales of smartphones reached 62 million in 2010 and 19.07 million handsets were sold in Q1 2011; sales of smartphones accounted for approximately 30 percent of all mobile phone sales, up from 19.2 percent in Q1 2010 according to research firm Analysys International. 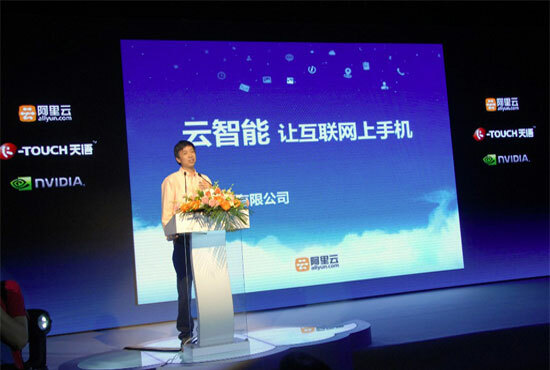 Wang Jian, president of Alibaba Cloud Computing, unveiled "Aliyun OS," a cloud-based mobile device operating system and the K-Touch Cloud-Smart Phone W700, the first mobile phone powered by the cloud OS, in Beijing on July 28, 2011. Alibaba Cloud Computing was established in September 2009 with the mission of building an advanced data-centric cloud computing service platform. The company is committed to supporting the growth of Alibaba Group and the whole e-commerce ecosystem by providing a comprehensive suite of Internet-based computing services, which include e-commerce data mining, high-speed massive e-commerce data processing, and data customization. Alibaba Cloud Computing is wholly owned by Alibaba Group. Alibaba Group is a global e-commerce leader and the largest e-commerce company in China. Since it was founded in 1999, Alibaba Group has grown to include the following core businesses: Alibaba.com (HKSE: 1688; 1688.HK), Alibaba Group's flagship company and the world's leading B2B e-commerce company; Taobao Marketplace, China's primary C2C online shopping destination; Taobao Mall, China's leading B2C online marketplace for quality, brand name goods; eTao, China's most comprehensive shopping search engine; Alibaba Cloud Computing, a developer of advanced data-centric cloud computing services; and China Yahoo!, one of China's leading Internet portals. Alipay, China's largest third-party online payment service, is an affiliate of Alibaba Group.